Liberty, the highest of natural endowments, being the portion only of intellectual or rational natures, confers on man this dignity -- that he is "in the hand of his counsel" and has power over his actions. But the manner in which such dignity is exercised is of the greatest moment, inasmuch as on the use that is made of liberty the highest good and the greatest evil alike depend. Man, indeed, is free to obey his reason, to seek moral good, and to strive unswervingly after his last end. Yet he is free also to turn aside to all other things; and, in pursuing the empty semblance of good, to disturb rightful order and to fall headlong into the destruction which he has voluntarily chosen. The Redeemer of mankind, Jesus Christ, having restored and exalted the original dignity of nature, vouchsafed special assistance to the will of man; and by the gifts of His grace here, and the promise of heavenly bliss hereafter, He raised it to a nobler state. In like manner, this great gift of nature has ever been, and always will be, deservingly cherished by the Catholic Church, for to her alone has been committed the charge of handing down to all ages the benefits purchased for us by Jesus Christ. Yet there are many who imagine that the Church is hostile to human liberty. Having a false and absurd notion as to what liberty is, either they pervert the very idea of freedom, or they extend it at their pleasure to many things in respect of which man cannot rightly be regarded as free. 2. We have on other occasions, and especially in Our encyclical letter lmmortale Dei, in treating of the so-called modern liberties, distinguished between their good and evil elements; and We have shown that whatsoever is good in those liberties is as ancient as truth itself, and that the Church has always most willingly approved and practiced that good: but whatsoever has been added as new is, to tell the plain truth, of a vitiated kind, the fruit of the disorders of the age, and of an insatiate longing after novelties. Seeing, however, that many cling so obstinately to their own opinion in this matter as to imagine these modern liberties, cankered as they are, to be the greatest glory of our age, and the very basis of civil life, without which no perfect government can be conceived, We feel it a pressing duty, for the sake of the common good, to treat separately of this subject. 3. It is with moral liberty, whether in individuals or in communities, that We proceed at once to deal. But, first of all, it will be well to speak briefly of natural liberty; for, though it is distinct and separate from moral liberty, natural freedom is the fountainhead from which liberty of whatsoever kind flows, sua vi suaque sponte. The unanimous consent and judgment of men, which is the trusty voice of nature, recognizes this natural liberty in those only who are endowed with intelligence or reason; and it is by his use of this that man is rightly regarded as responsible for his actions. For, while other animate creatures follow their senses, seeking good and avoiding evil only by instinct, man has reason to guide him in each and every act of his life. Reason sees that whatever things that are held to be good upon earth may exist or may not, and discerning that none of them are of necessity for us, it leaves the will free to choose what it pleases. But man can judge of this contingency, as We say, only because he has a soul that is simple, spiritual, and intellectual -- a soul, therefore, which is not produced by matter, and does not depend on matter for its existence; but which is created immediately by God, and, far surpassing the condition of things material, has a life and action of its own -- so that, knowing the unchangeable and necessary reasons of what is true and good, it sees that no particular kind of good is necessary to us. When, therefore, it is established that man's soul is immortal and endowed with reason and not bound up with things material, the foundation of natural liberty is at once most firmly laid. 4. As the Catholic Church declares in the strongest terms the simplicity, spirituality, and immortality of the soul, so with unequaled constancy and publicity she ever also asserts its freedom. These truths she has always taught, and has sustained them as a dogma of faith, and whensoever heretics or innovators have attacked the liberty of man, the Church has defended it and protected this noble possession from destruction. History bears witness to the energy with which she met the fury of the Manicheans and others like them; and the earnestness with which in later years she defended human liberty at the Council of Trent, and against the followers of Jansenius, is known to all. At no time, and in no place, has she held truce with fatalism. 6. Since, however, both these faculties are imperfect, it is possible, as is often seen, that the reason should propose something which is not really good, but which has the appearance of good, and that the will should choose accordingly. For, as the possibility of error, and actual error, are defects of the mind and attest its imperfection, so the pursuit of what has a false appearance of good, though a proof of our freedom, just as a disease is a proof of our vitality, implies defect in human liberty. The will also, simply because of its dependence on the reason, no sooner desires anything contrary thereto than it abuses its freedom of choice and corrupts its very essence. Thus it is that the infinitely perfect God, although supremely free, because of the supremacy of His intellect and of His essential goodness, nevertheless cannot choose evil; neither can the angels and saints, who enjoy the beatific vision. St. Augustine and others urged most admirably against the Pelagians that, if the possibility of deflection from good belonged to the essence or perfection of liberty, then God, Jesus Christ, and the angels and saints, who have not this power, would have no liberty at all, or would have less liberty than man has in his state of pilgrimage and imperfection. This subject is often discussed by the Angelic Doctor in his demonstration that the possibility of sinning is not freedom, but slavery. It will suffice to quote his subtle commentary on the words of our Lord: "Whosoever committeth sin is the slave of sin." "Everything," he says, "is that which belongs to it naturally. When, therefore, it acts through a power outside itself, it does not act of itself, but through another, that is, as a slave. But man is by nature rational. When, therefore, he acts according to reason, he acts of himself and according to his free will; and this is liberty. Whereas, when he sins, he acts in opposition to reason, is moved by another, and is the victim of foreign misapprehensions. Therefore, 'Whosoever committeth sin is the slave of sin'." Even the heathen philosophers clearly recognized this truth, especially they who held that the wise man alone is free; and by the term "wise man" was meant, as is well known, the man trained to live in accordance with his nature, that is, in justice and virtue. 8. Foremost in this office comes the natural law, which is written and engraved in the mind of every man; and this is nothing but our reason, commanding us to do right and forbidding sin. Nevertheless, all prescriptions of human reason can have force of law only inasmuch as they are the voice and the interpreters of some higher power on which our reason and liberty necessarily depend. For, since the force of law consists in the imposing of obligations and the granting of rights, authority is the one and only foundation of all law -- the power, that is, of fixing duties and defining rights, as also of assigning the necessary sanctions of reward and chastisement to each and all of its commands. But all this, clearly, cannot be found in man, if, as his own supreme legislator, he is to be the rule of his own actions. It follows, therefore, that the law of nature is the same thing as the eternal law, implanted in rational creatures, and inclining them to their right action and end; and can be nothing else but the eternal reason of God, the Creator and Ruler of all the world. To this rule of action and restraint of evil God has vouchsafed to give special and most suitable aids for strengthening and ordering the human will. The first and most excellent of these is the power of His divine grace, whereby the mind can be enlightened and the will wholesomely invigorated and moved to the constant pursuit of moral good, so that the use of our inborn liberty becomes at once less difficult and less dangerous. Not that the divine assistance hinders in any way the free movement of our will; just the contrary, for grace works inwardly in man and in harmony with his natural inclinations, since it flows from the very Creator of his mind and will, by whom all things are moved in conformity with their nature. As the Angelic Doctor points out, it is because divine grace comes from the Author of nature that it is so admirably adapted to be the safeguard of all natures, and to maintain the character, efficiency, and operations of each. 13. Moreover, the highest duty is to respect authority, and obediently to submit to just law; and by this the members of a community are effectually protected from the wrong-doing of evil men. Lawful power is from God, "and whosoever resisteth authority resisteth the ordinance of God"; wherefore, obedience is greatly ennobled when subjected to an authority which is the most just and supreme of all. But where the power to command is wanting, or where a law is enacted contrary to reason, or to the eternal law, or to some ordinance of God, obedience is unlawful, lest, while obeying man, we become disobedient to God. Thus, an effectual barrier being opposed to tyranny, the authority in the State will not have all its own way, but the interests and rights of all will be safeguarded -- the rights of individuals, of domestic society, and of all the members of the commonwealth; all being free to live according to law and right reason; and in this, as We have shown, true liberty really consists. 17. There are, indeed, some adherents of liberalism who do not subscribe to these opinions, which we have seen to be fearful in their enormity, openly opposed to the truth, and the cause of most terrible evils. Indeed, very many amongst them, compelled by the force of truth, do not hesitate to admit that such liberty is vicious, nay, is simple license, whenever intemperate in its claims, to the neglect of truth and justice; and therefore they would have liberty ruled and directed by right reason, and consequently subject to the natural law and to the divine eternal law. But here they think they may stop, holding that man as a free being is bound by no law of God except such as He makes known to us through our natural reason. In this they are plainly inconsistent. For if -- as they must admit, and no one can rightly deny -- the will of the Divine Law-giver is to be obeyed, because every man is under the power of God, and tends toward Him as his end, it follows that no one can assign limits to His legislative authority without failing in the obedience which is due. Indeed, if the human mind be so presumptuous as to define the nature and extent of God's rights and its own duties, reverence for the divine law will be apparent rather than real, and arbitrary judgment will prevail over the authority and providence of God. Man must, therefore, take his standard of a loyal and religious life from the eternal law; and from all and every one of those laws which God, in His infinite wisdom and power, has been pleased to enact, and to make known to us by such clear and unmistakable signs as to leave no room for doubt. And the more so because laws of this kind have the same origin, the same author, as the eternal law, are absolutely in accordance with right reason, and perfect the natural law. These laws it is that embody the government of God, who graciously guides and directs the intellect and the will of man lest these fall into error. Let, then, that continue to remain in a holy and inviolable union which neither can nor should be separated; and in all things -- for this is the dictate of right reason itself -- let God be dutifully and obediently served. 21. This kind of liberty, if considered in relation to the State, clearly implies that there is no reason why the State should offer any homage to God, or should desire any public recognition of Him; that no one form of worship is to be preferred to another, but that all stand on an equal footing, no account being taken of the religion of the people, even if they profess the Catholic faith. But, to justify this, it must needs be taken as true that the State has no duties toward God, or that such duties, if they exist, can be abandoned with impunity, both of which assertions are manifestly false. For it cannot be doubted but that, by the will of God, men are united in civil society; whether its component parts be considered; or its form, which implies authority; or the object of its existence; or the abundance of the vast services which it renders to man. God it is who has made man for society, and has placed him in the company of others like himself, so that what was wanting to his nature, and beyond his attainment if left to his own resources, he might obtain by association with others. Wherefore, civil society must acknowledge God as its Founder and Parent, and must obey and reverence His power and authority. justice therefore forbids, and reason itself forbids, the State to be godless; or to adopt a line of action which would end in godlessness -- namely, to treat the various religions (as they call them) alike, and to bestow upon them promiscuously equal rights and privileges. 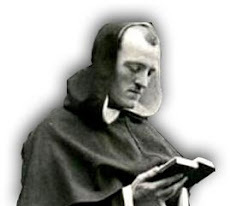 Since, then, the profession of one religion is necessary in the State, that religion must be professed which alone is true, and which can be recognized without difficulty, especially in Catholic States, because the marks of truth are, as it were, engraven upon it. 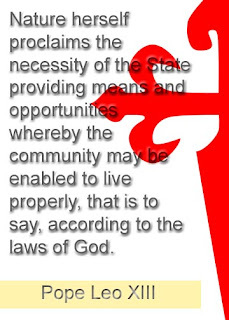 This religion, therefore, the rulers of the State must preserve and protect, if they would provide -- as they should do -- with prudence and usefulness for the good of the community. For public authority exists for the welfare of those whom it governs; and, although its proximate end is to lead men to the prosperity found in this life, yet, in so doing, it ought not to diminish, but rather to increase, man's capability of attaining to the supreme good in which his everlasting happiness consists: which never can be attained if religion be disregarded. 23. We must now consider briefly liberty of speech, and liberty of the press. It is hardly necessary to say that there can be no such right as this, if it be not used in moderation, and if it pass beyond the bounds and end of all true liberty. For right is a moral power which -- as We have before said and must again and again repeat -- it is absurd to suppose that nature has accorded indifferently to truth and falsehood, to justice and injustice. Men have a right freely and prudently to propagate throughout the State what things soever are true and honorable, so that as many as possible may possess them; but Iying opinions, than which no mental plague is greater, and vices which corrupt the heart and moral life should be diligently repressed by public authority, lest they insidiously work the ruin of the State. The excesses of an unbridled intellect, which unfailingly end in the oppression of the untutored multitude, are no less rightly controlled by the authority of the law than are the injuries inflicted by violence upon the weak. And this all the more surely, because by far the greater part of the community is either absolutely unable, or able only with great difficulty, to escape from illusions and deceitful subtleties, especially such as flatter the passions. If unbridled license of speech and of writing be granted to all, nothing will remain sacred and inviolate; even the highest and truest mandates of natures, justly held to be the common and noblest heritage of the human race, will not be spared. Thus, truth being gradually obscured by darkness, pernicious and manifold error, as too often happens, will easily prevail. Thus, too, license will gain what liberty loses; for liberty will ever be more free and secure in proportion as license is kept in fuller restraint. In regard, however, to all matter of opinion which God leaves to man's free discussion, full liberty of thought and of speech is naturally within the right of everyone; for such liberty never leads men to suppress the truth, but often to discover it and make it known. 24. A like judgment must be passed upon what is called liberty of teaching. There can be no doubt that truth alone should imbue the minds of men, for in it are found the well-being, the end, and the perfection of every intelligent nature; and therefore nothing but truth should be taught both to the ignorant and to the educated, so as to bring knowledge to those who have it not, and to preserve it in those who possess it. For this reason it is plainly the duty of all who teach to banish error from the mind, and by sure safeguards to close the entry to all false convictions. From this it follows, as is evident, that the liberty of which We have been speaking is greatly opposed to reason, and tends absolutely to pervert men's minds, in as much as it claims for itself the right of teaching whatever it pleases -- a liberty which the State cannot grant without failing in its duty. And the more so because the authority of teachers has great weight with their hearers, who can rarely decide for themselves as to the truth or falsehood of the instruction given to them. 26. But with no less religious care must we preserve that great and sacred treasure of the truths which God Himself has taught us. By many and convincing arguments, often used by defenders of Christianity, certain leading truths have been laid down: namely, that some things have been revealed by God; that the Onlybegotten Son of God was made flesh, to bear witness to the truth; that a perfect society was founded by Him -- the Church, namely, of which He is the head, and with which He has promised to abide till the end of the world. To this society He entrusted all the truths which He had taught, in order that it might keep and guard them and with lawful authority explain them; and at the same time He commanded all nations to hear the voice of the Church, as if it were His own, threatening those who would not hear it with everlasting perdition. Thus, it is manifest that man's best and surest teacher is God, the Source and Principle of all truth; and the only-begotten Son, who is in the bosom of the Father, the Way, the Truth, and the Life, the true Light which enlightens every man, and to whose teaching all must submit: "And they shall all be taught of God. " 27. In faith and in the teaching of morality, God Himself made the Church a partaker of His divine authority, and through His heavenly gift she cannot be deceived. She is therefore the greatest and most reliable teacher of mankind, and in her swells an inviolable right to teach them. Sustained by the truth received from her divine Founder, the Church has ever sought to fulfill holily the mission entrusted to her by God; unconquered by the difficulties on all sides surrounding her, she has never ceased to assert her liberty of teaching, and in this way the wretched superstition of paganism being dispelled, the wide world was renewed unto Christian wisdom. Now, reason itself clearly teaches that the truths of divine revelation and those of nature cannot really be opposed to one another, and that whatever is at variance with them must necessarily be false. Therefore, the divine teaching of the Church, so far from being an obstacle to the pursuit of learning and the progress of science, or in any way retarding the advance of civilization, in reality brings to them the sure guidance of shining light. And for the same reason it is of no small advantage for the perfecting of human liberty, since our Savior Jesus Christ has said that by truth is man made free: "You shall know the truth, and the truth shall make you free." Therefore, there is no reason why genuine liberty should grow indignant, or true science feel aggrieved, at having to bear the just and necessary restraint of laws by which, in the judgment of the Church and of reason itself, human teaching has to be controlled. 28. The Church, indeed -- as facts have everywhere proved -- looks chiefly and above all to the defense of the Christian faith, while careful at the same time to foster and promote every kind of human learning. For learning is in itself good, and praiseworthy, and desirable; and further, all erudition which is the outgrowth of sound reason, and in conformity with the truth of things, serves not a little to confirm what we believe on the authority of God. The Church, truly, to our great benefit, has carefully preserved the monuments of ancient wisdom; has opened everywhere homes of science, and has urged on intellectual progress by fostering most diligently the arts by which the culture of our age is so much advanced. 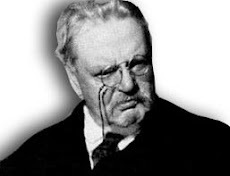 Lastly, we must not forget that a vast field lies freely open to man's industry and genius, containing all those things which have no necessary connection with Christian faith and morals, or as to which the Church, exercising no authority, leaves the judgment of the learned free and unconstrained. 30. Another liberty is widely advocated, namely, liberty of conscience. If by this is meant that everyone may, as he chooses, worship God or not, it is sufficiently refuted by the arguments already adduced. But it may also be taken to mean that every man in the State may follow the will of God and, from a consciousness of duty and free from every obstacle, obey His commands. This, indeed, is true liberty, a liberty worthy of the sons of God, which nobly maintains the dignity of man and is stronger than all violence or wrong -- a liberty which the Church has always desired and held most dear. This is the kind of liberty the Apostles claimed for themselves with intrepid constancy, which the apologists of Christianity confirmed by their writings, and which the martyrs in vast numbers consecrated by their blood. And deservedly so; for this Christian liberty bears witness to the absolute and most just dominion of God over man, and to the chief and supreme duty of man toward God. It has nothing in common with a seditious and rebellious mind; and in no tittle derogates from obedience to public authority; for the right to command and to require obedience exists only so far as it is in accordance with the authority of God, and is within the measure that He has laid down. But when anything is commanded which is plainly at variance with the will of God, there is a wide departure from this divinely constituted order, and at the same time a direct conflict with divine authority; therefore, it is right not to obey. 34. 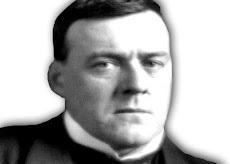 But, to judge aright, we must acknowledge that, the more a State is driven to tolerate evil, the further is it from perfection; and that the tolerance of evil which is dictated by political prudence should be strictly confined to the limits which its justifying cause, the public welfare, requires. Wherefore, if such tolerance would be injurious to the public welfare, and entail greater evils on the State, it would not be lawful; for in such case the motive of good is wanting. And although in the extraordinary condition of these times the Church usually acquiesces in certain modern liberties, not because she prefers them in themselves, but because she judges it expedient to permit them, she would in happier times exercise her own liberty; and, by persuasion, exhortation, and entreaty would endeavor, as she is bound, to fulfill the duty assigned to her by God of providing for the eternal salvation of mankind. One thing, however, remains always true -- that the liberty which is claimed for all to do all things is not, as We have often said, of itself desirable, inasmuch as it is contrary to reason that error and truth should have equal rights. 44. Again, it is not of itself wrong to prefer a democratic form of government, if only the Catholic doctrine be maintained as to the origin and exercise of power. Of the various forms of government, the Church does not reject any that are fitted to procure the welfare of the subject; she wishes only -- and this nature itself requires -- that they should be constituted without involving wrong to any one, and especially without violating the rights of the Church. 4. Thomas Aquinas, On the Gospel of St. John, cap. viii, lect. 4, n. 3 (ed. Vives, Vol. 20, p. 95). 5. Augustine, De libero arbitrio, lib. 1, cap. 6, n. 15 (PL 32, 1229). 7. Summa theologiae, lla-llae, q. Ixxxi, a. 6. Answer. 10. Augustine, De libero arbitrio, lib. 1, cap. 6, n. 14 (PL 32, 1228). 11. Summa theologiae, la, q. xix, a. 9, ad 3m.